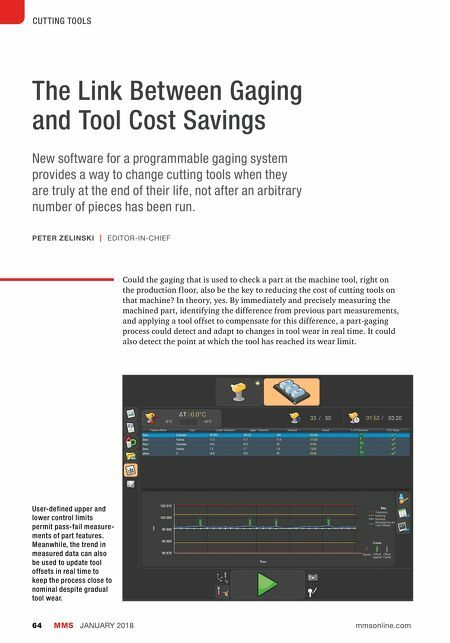 MMS JANUARY 2018 64 mmsonline.com CUTTING TOOLS The Link Between Gaging and Tool Cost Savings New software for a programmable gaging system provides a way to change cutting tools when they are truly at the end of their life, not after an arbitrary number of pieces has been run. Could the gaging that is used to check a part at the machine tool, right on the production f loor, also be the key to reducing the cost of cutting tools on that machine? In theory, yes. 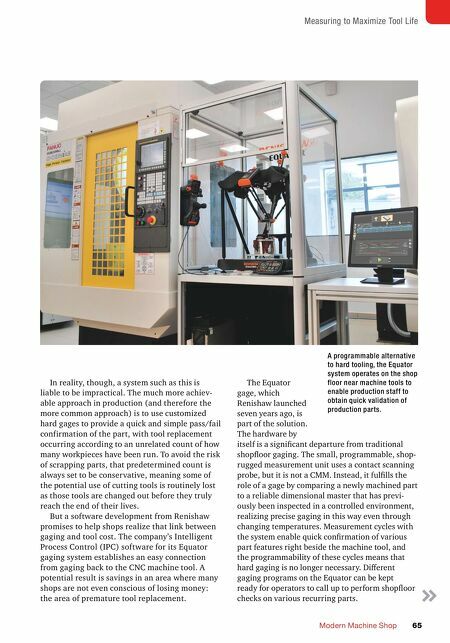 By immediately and precisely measuring the machined part, identifying the difference from previous part measurements, and applying a tool offset to compensate for this difference, a part-gaging process could detect and adapt to changes in tool wear in real time. It could also detect the point at which the tool has reached its wear limit. PETER ZELINSKI | EDITOR-IN-CHIEF User-defined upper and lower control limits permit pass-fail measure- ments of part features. Meanwhile, the trend in measured data can also be used to update tool offsets in real time to keep the process close to nominal despite gradual tool wear.